At 7 months old, my littlest man still has that adorably gummy little smile. His first tooth is yet to poke through and I am quite happy with things that way for now. Despite the lack of a little toothy-peg, teething is well and truly under-way and we have the dribble, rosy cheeks and constant urge to chew everything. 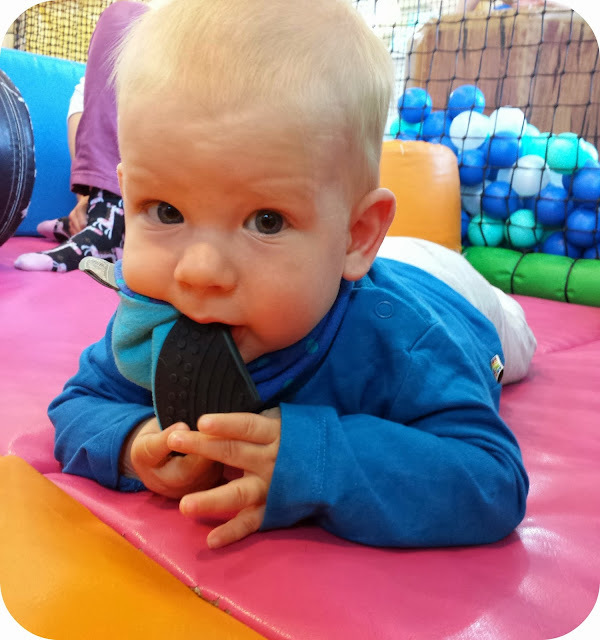 It is hard to put the sleepless nights and grumps down to teething when he is still too young to communicate but I don't doubt that it is playing a rather large part. I thought I would share what is helping us through the tough teething times though. With winter on its way, I need to make sure Archie does not have a soaking wet patch on his clothes and we are using bibs to soak up the inevitable dribble. I am a huge fan of the bandana style and there are so many out there, that you can get ones to match every outfit. I find the bibs that are backed with fleece are best for keeping Archie dry and we now have quite a selection. We were sent a Neckerchew for Archie which is a bandana bib with a teether built in the end of it and now that his motor skills have developed, he is loving it. 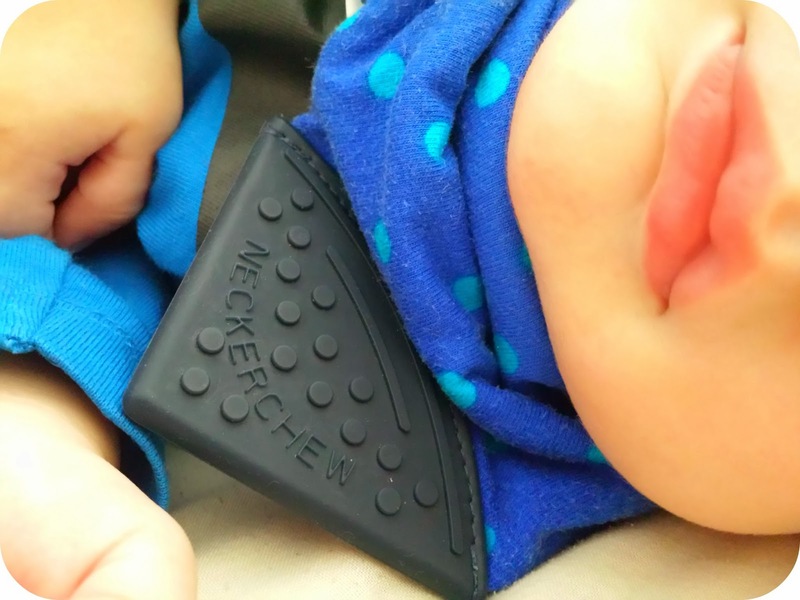 The fact that the teether is built in means no dropping it out the buggy in a dirty carpark, or losing it in the car, and it is fully machine washable. It did take Archie until 6/7 months to have the co-ordination to use it properly but we find it great for travelling with. The bib is not quite as absorbent as some of the others we have used but it is well worth investing in one for convenience, and you can always stick another bib underneath if your child is super dribbly. They are all reversible and so go with loads of outfits. Bonjela is great, but babies teeth come through in different orders and I used to find myself applying it to Dylan's entire mouth. With Teetha powder, I just tip it in Archie's mouth and it instantly calms him. He seems to like the taste of it and it is really easy to carry in the nappy bag, my handbag and even my purse (I like to be prepared!). We keep the Calpol for the really bad days, but Teetha is our go-to solution for everyday teething woes. This toy has been around for years, but I was dubious when Dylan was small and I didn't believe the hype. I decided to splash out the £10.99 this time though and see whether Archie would get on with it, and it is now a handbag essential. Despite both my boys preferring to chew a finger over a refrigerated ring, Sophie is a hit and Archie finds her easy to hold and chew. No matter how they hold it, something will fit in their mouths and as soon as I started squeaking it, his little arms start going in excitement. I am well and truly a convert to Sophie and it was definitely an investment I would make again. When Dylan was a couple of months old, I bought him an amber teething necklace. At 25 months, it still sits round his neck and has become a part of him. 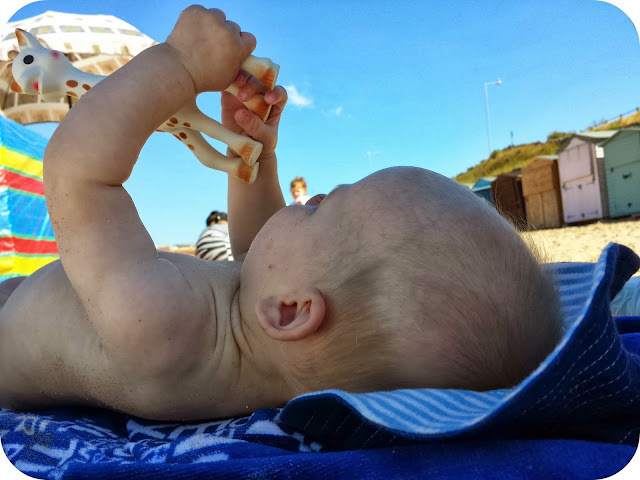 I honestly can't say whether it works or not, but we have never had a sleepless night from Dylan's teeth and despite copious amounts of dribble, the whole process of teething was rather easy. We have been sent a Baltic amber anklet for Archie from Amber Anklets and I don't think we will be taking it off in a hurry. It has fallen off a couple of times, I am not sure whether his ankles are a little skinny or whether his desire to chew his own toes means he pulls it, but we are being more careful now and it seems to be staying put. Each bead is individually tied on, which means that even if it does break, there are no little pieces rolling around to be eaten. Dylan has been wearing his necklace for nearly 2 years though and it is still completely intact. If all else fails, breast feeding provides such a comfort to my little man that it is more than just sustenance, and the milk contains properties that help relieve the discomfort. Archie is still fed on demand and I know that on a difficult day he may feed a little more but it is worth it to give him some relief from the teething horrors. So that is my teething survival kit, is there anything you would add? Disclaimer: I was sent an amber teething anklet and a neckerchew free of charge but all other items mentioned have been purchased by myself. All views and opinions are completely my own.